Organic Flea Eradication and Control Treatment Pack offers a non toxic, chemical free method to kill, stop and get rid of fleas naturally and organically. We would advise that you vacuum settees and chairs as well as vacuuming all around and then empty the vacuum prior to starting the process. Also you should change pets bedding. 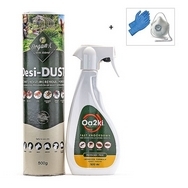 Thorough application of all the Flea Pest Control Products contained in this pack will allow an effective treatment to eliminate these biting insect pests. Aong with this treatment, a suitable flea product from the VET should be applied to your cat or dog.